Hoth's Heroes is a program created by the Alaskan Garrison Command Staff to help increase the attendance of the Alaska based Star Wars family of 501st Legion, Rebel Legion, Mandalorian Mercs, Galactic Academy, and Astromech Builders at events and to do more good deeds across the state in the name of Star Wars. The program is a friendly internal contest amongest our members to be the best of the best and it awards and showcases our most active troopers each month. The top thirteen troopers overall as counted by total number of troops attended in costume from 01 January to 31 December, are considered the Hoth's Heroes for the month. In the event of a tie in the event count, members will be listed alphabetically by last name. 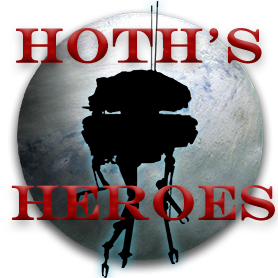 Be sure to check out our main page where the current Hoth's Heroes' and their current number of attended troops is listed. Think you have what it takes to become one of our Hoth's Heroes? Join the ranks of the 501st Legion or our Sister organizations now and help put smiles on childrens faces in the name of Star Wars!